It's been a bit of a seesaw week so far. Sadly I had the bad news on my existing published writing a couple of days ago. My short story, 'The Wishful Spirit', currently on the Alfie Dog Fiction download site will no longer be available after July 20th. It's also likely that the One Word Anthology that both I and Serena have stories in will also go, but I'm waiting for definite confirmation of that. Of course it does mean those stories are available for re-use at some time in the future. But for the moment I'm concentrating on the work in progress and not allowing these downs to distract me. Trying to do a little tidying up I had a shredding session yesterday, and of course the container quickly filled up and needed emptying. No problem, there's a bin bag half full of shredded paperwork, I'll use that and it will be full ready for going to the recycling centre. Next time I'll call someone to hold the bag for me, or better yet I'll hold the bag and they can tip! Sounds like you're making good progress on the novel, Carol. Shredded paper seems to have a mind of its own! Unfortunately our local council won't recycle shredded paper so it has to go in the household waste - which seems a shame. Teresa- having a self-imposed deadline is really working wellx. Our Council used to accept shredded paper, but then they stopped, so now it either has to go in the rubbish bin or we can take it to the local recycling centre- where it gets put into the paper collection! I hope you find a new home for your Alfie Dog stories. 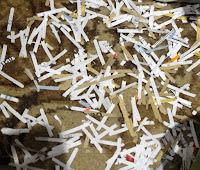 Incidentally, you can put shredded paper in your compost bin. I've never had much luck with making compost in the past, and I don't know if the 70 parts shredded paper would help much either. :( But thanks for the suggestion, I'll have to try small amounts. I love shredding sessions - they are so therapeutic! Sounds to me that you're still moving in the right direction - Don't worry too much about your story being taken down off the Alfie Dog site. Remember, when one door closes another one opens. Delve deep and find another home for it. You can do it. As for the shredding - I have no advice as I let others do it for me. They seem to take real pleasure from it! Have a good week, catch you soon. Maria - it's sad but I'm not alone, and it will find a new home, probably when I least expect it.